WHO'S THE HOTTIE THAT CAN PLAY SOCCER/FOOTBALL IN PORTUGAL?? Much known for his fancy flicks and stepovers. Became the most expensive teenager in Britain in 2003. His idol is Luis Figo. Was selected for the Portuguese Olympic football team for 2004. Wears the number 7 shirt. Signed by Manchester United from Sporting Lisbon in August 2003 for an initial 12,240,000. Scored the first goal in the 2004 FA Cup Final against Millwall FC. 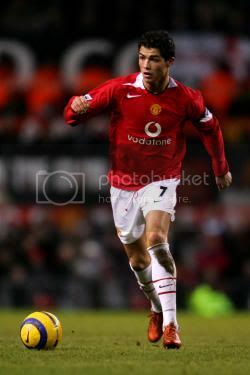 Made his full Manchester United debut against Wolves in August 2003. Scored 2 goals that helped Manchester United beat Arsenal 4-2 at Highbury. Has appeared in a Suzuki TV advert. Voted player of the 2003/04 season. His father named him after former American President Ronald Reagan. He was the first ever Portugese Manchester United player. His parents names are Maria Dolores dos Santos Aveiro and Jose Diniz Aveiro. Has been criticized many times for diving in the penalty area. Has appeared in several Nike adverts. Before joining Manchester United he played against them for Sporting Lisbon weeks later he was signed by Manchester United. Sporting Lisbon signed him up for their schoolboy team at the age of 13 for 1,500. He was born into a poor family on the Portuguese island of Madeira off the Morrocan coast. Was signed by Manchester United as a long term replacement for David Beckham. He is a very big idol in his hometown Madeira. Made his international debut for Portugal against Kazakhstan in August 2003. Scored his first Manchester United goal against Portsmouth FC at Old Trafford. Starting playing for his local football side Nacional. His father passed away while he was on international duty in Russia. In the first ever FIFPro awards was voted the special young player of the year award. After playing against Manchester United in a pre-season friendly the Manchester United players urged the manager to sign Cristiano on the the plane back to Manchester. Bought a 1.5 million pound mansion in Cheshire which was previously owned by 3 former Manchester United players. Flew to Indonesia to visit the areas affected by the tsunami and raised over 1 billion rupiah by auctioning off his personal sports gear. Grew up with his brother and 2 sisters. Scored Manchester United's 1,000th league goal against Middlesbrough FC. Wears the number 17 shirt whenever he plays for Portugal. Was named in the UEFA Team of the year 2004. Ended the 2004/05 season making 50 appearances and scoring 9 goals. Cristiano was first spotted by former Liverpool F.C manager Gerrard Houllier at the age of 16. Cristiano drives a red Ferrari 435. 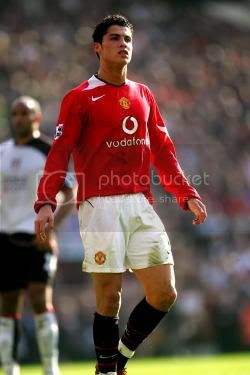 Ended the 2005/06 season making 37 appearances 10 as a sub and scoring a season best for Manchester united with 12 goals. "I would be very proud if, one day, I'm held in the same esteem as George Best or Beckham. It's what I'm working hard towards." "Lots of young players have triumphed at United, so why can't it happen to me? I'm not worried I'm young - it's an incentive to do the best I can." "The No 7 shirt is an honor and a responsibility. I hope it brings me a lot of luck." (August 2005) Starting his third season playing for Manchester United FC. Favourite Movies: "The Sixth Sense" and "The Rock"
Hobbies: Going for walks, going to the cinema, listening to music and sometimes just spending time alone. and ya david beckham is a hottie too....but ain't he married??? i have some signatures for him...here...u like? im so in!! !i luv ranaldo hes so hott!! !